When choosing an endmill for a particular milling operation, there are many possibilities as to which tool is best for the job. Tool material (the actual substance the tool is born from), the specific characteristics of the tool, and whether or not you want a coating on that tool all play an integral role and can have a significant effect on whether these things add value or significant cost to your milling application. High Speed Steel (HS): HSS is a baseline tool steel used for many basic machining applications and for short runs on older milling machines. However, it does not offer the speed and feed advantages of HSS-Cobalt and Carbide tools. Cobalt: With a typical cobalt content of 8 percent, this tool is usually priced a bit higher than standard HSS. It allows for increased speeds and feeds because of greater hardness, though it still falls far short of the speed, feed, and durability advantages of carbide. Ensure that your machine tool is rigid with a solid spindle and that holders have little or no runout. Due to the brittle nature of carbide and the speeds at which carbide tools are typically run, rigidity is critical to prevent tool breakage. The initial cost of carbide tooling over HSS products is easily offset by savings in production costs due to increased output and fewer tool changes. Carbide is more sensitive to chipping than HSS, so handle with extreme care. Length: Select an endmill that is as short as possible to minimize tool deflection during the milling operation. Select stub lengths, if possible, to save on tool cost. Stub Length - Used for milling of shallow slots in all types of materials where heavy feeds are required and tool deflection is minimized. Number of Flutes: More flutes reduce chip load and improves surface finish if feed rate remains the same. The most common flute numbers for general milling operations are two (maximum space for chip ejection) and four (better surface finish). 2-Flute - Allows maximum space for chip ejection. Used for general milling operations and on softer metals. 3-Flute - Excellent for slotting. Used for general milling operations. Also good for a cross between higher chip removal and finish. 4-Flute - Use for better rigidity and finish on ferrous metals . 6 & 8 Flute - These larger number of flutes reduces chip load and can improve surface finish. As such these tools are excellent for putting the the final finish on the application, and removing any rough spots from previous milling. Certain materials respond better to various flute configurations. Below is a chart to help you decided what number of flutes is best for the material you are milling. Rake Angle: Endmills typically have a 10-12 degree positive rake angle. This allows for efficient cutting performances of soft, gummy materials as well as high tensile strength materials. Depending on the material to be machined, it is possible to change the rake angles. Used in conjunction with variation of rake, clearance angles can be altered to provide added support and strength directly behind the cutting edge. Helix Angle: The standard helix angle of an endmill is usually 30. Higher helix angles provide better chip ejection and are useful in machining materials such as aluminum at a much faster rate. Ball End: The tip of the tool is rounded or in the shape of a half-ball. 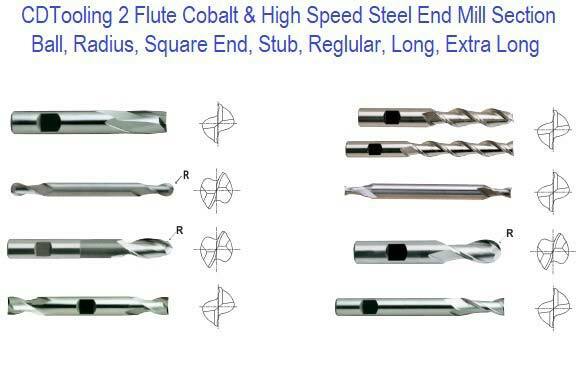 These endmills are used to mill die cavities and fillets, round bottom holes and slots. 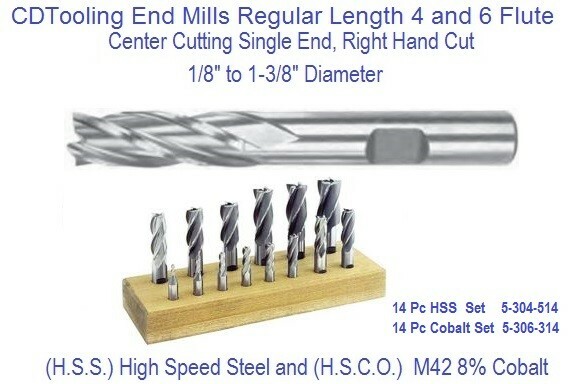 Center Cutting and Non Center Cutting:Center cutting square endmills are essential for plunge milling. 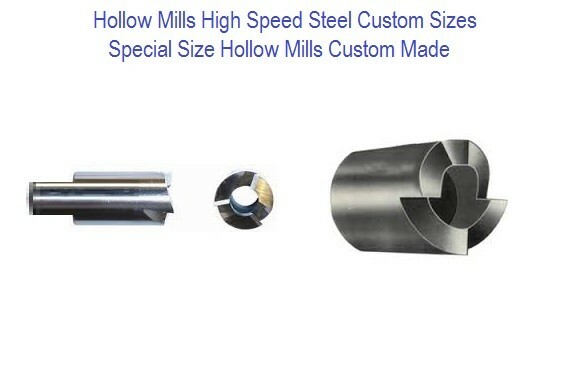 Use non-center cutting mills only for side milling. Corner Radius: Since the sharp corner of the endmill is its weakest point, a ground radius on the cutting tips is useful to prevent chipping of the tool tips. 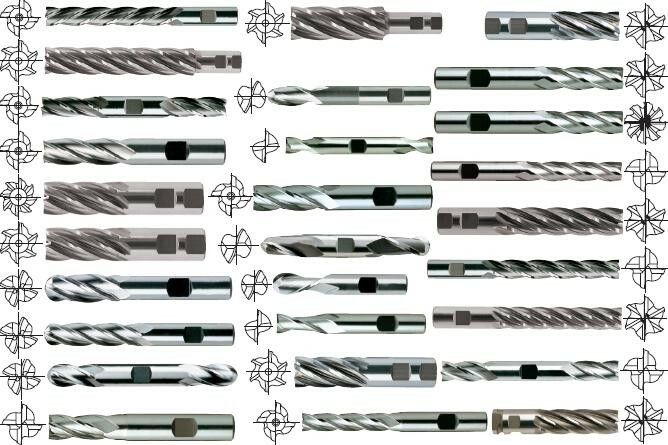 These corner radius tools remove more material faster than the traditional ball nose endmills, but consideration must be given to the shape of the cut. Best use is for mold applications because the ball end can remove more material faster than ball ends. Corner Rounding endmills provide a uniform finish on corners. They have a ground radius with relieved clearance. Single End - Teeth on one end of the cutter only. This style is the most common available. Double End - An end mill that has teeth on both ends of the cutter. Endmill holders must have sufficient clearance to allow for the use of a double end cutter. Drill Point endmills are multipurpose cutting tools. 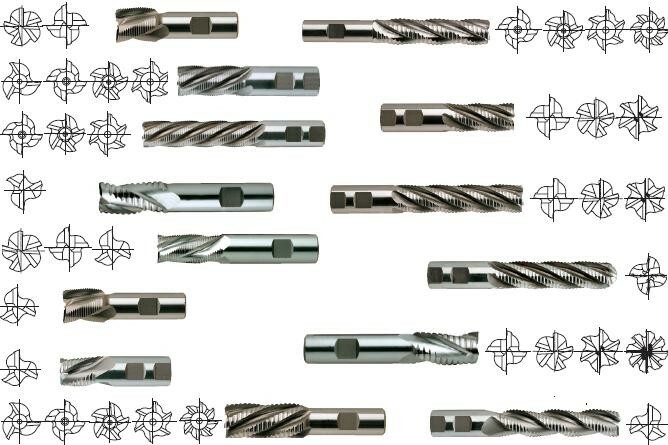 Use them for drilling, slotting, chamfering, and profile milling. Chamfer Mills can eliminate hand deburring operations and provide uniform material finish. Roughers, or "hoggers", are useful for rapid removing of large amounts of material. The chip grove design allows more cutting fluid to the cutting edges and dissipates heat better. 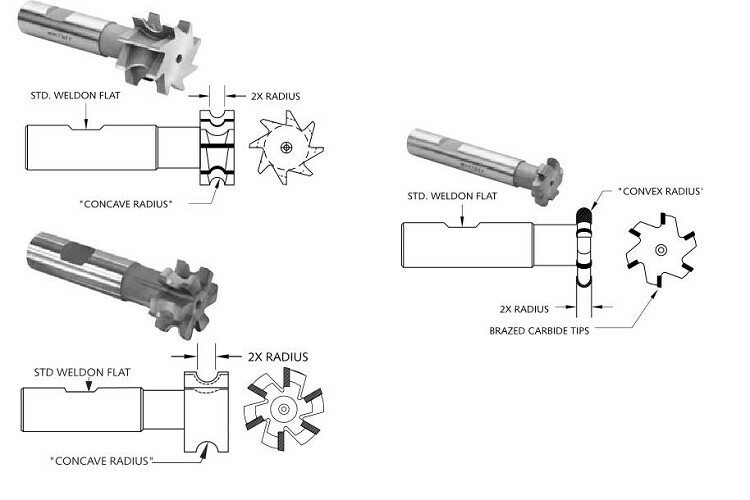 There is a wide range of variations in rougher profile forms for different material groups. The coarser the pitch of the roughing edge, the more material removed and the less smooth the finish. In addition, most roughers have eccentric relief so regrinding can be done by grinding only the cutting face. This saves you if you have access to regrinding equipment. Left-Hand Spiral - Used for milling multiple layers of thin sheets where chip flow is directed away from work. TiAlN for superior extreme machining results. With a thermal stability above 1,600F (900C) this coating excels in high speed dry machining applications. Harder than our original TiAlN by 1000 HV, with an increase in thermal stability of 200F (100C), PowerA will ensure that heat buildup, friction, and edge breakdown are all greatly reduced, resulting in better cutting performance and longer tool life. As with its predecessor, PowerA will be an excellent coating for applications involving tough-to-cut tool steels, stainless, cast iron and non-ferrous material, and it can also be used very effectively for interrupted cuts. PowerA can be run at more aggressive speeds and feeds than other coatings, and can be run without coolant in specific applications. PowerA continues to be the coating of choice for tough-to-cut materials. Titanium Nitride (TiN) Coating is bright gold in color, has an ambient temperature hardness in the 2800 Vickers (low 80Rc) range, a coefficient of friction under 0.5, and a thermal stability up to about 1000F. TiN meets FDA requirements for surgical tools and food applications. Cutting speeds, feeds, wear resistance and tool life generally improve. Lubricity (0.5 coefficient of friction). highest hardness, the smoothest surface, and a very low coefficient of friction. This specialty coating is used primarily for cutting tools used in composite materials with an affinity for sticking. It gives the closest performance to real diamond coatings, but in a thin layer form. Angular Edge - The cutting edge that is a straight line and forms an angle with the cutter axis. The cut that an Angular edge tool produces will not be as flat as a helical cutting edge. Axial Runout - The difference between the highest and lowest indicator reading that is taken at the face of a cutter near the outer diameter. Back taper - A slight taper resulting in the shank end of the cutting diameter being smaller than the cutting end. This condition aids not only the plunging or drilling condition but also tends to compensate for deflection. Chamfer - A short relieved flat installed where the periphery and face of a cutter meet. It is used to strengthen the otherwise weak corner. Chip Breakers - Special geometry of the rake face that causes the chip to curl tightly and break. Chip Splitters - Notches in the circumference of a corn-cob style Endmill cutter resulting in narrow chips. Suitable for rough machining. Clearance - Space created by the removal of additional tool material from behind the relief angle. Clearance Angle - The angle formed by the cleared surface and line tangent to the cutting edge. Clearance: Primary (first angle 5 - 9 degree) - Relief adjacent to the cutting edge. Clearance: Secondary (2nd angle 14 - 17 degrees) - Relief adjacent to the cutting edge. Clearance: Tertiary (3rd) - Additional relief clearance provided adjacent to the secondary angle. Concave - Small hollow required on the end face of an Endmill. This feature is produced by a dish angle produced on the cutter. Convex - An outward projection radius feature on the end face of a ball mill. Core Diameter - The diameter of a cylinder (or cone shape with tapered Endmills) tangent to the flutes at the deepest point. Counterbore - A recess in a non-end cutting tool to facilitate grinding. Cutter Sweep (Runout) - Tool material removed by the fluting cutter (or grinding wheel) at the end of the flute. 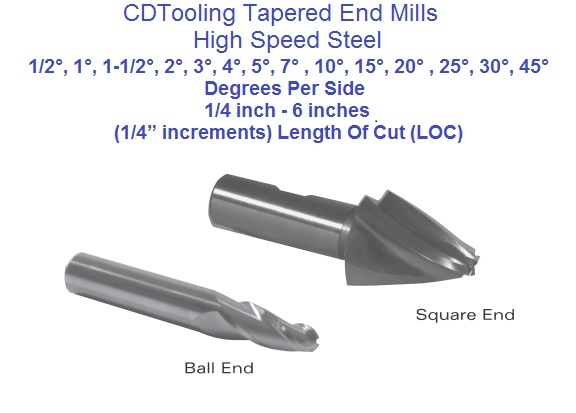 Cutting Edge - The leading edge of the cutter tooth. The intersection of two finely finished surfaces, generally of an included angle of less than 90 degrees. Cutting Edge Angle - The angle formed by the cutting edge and the tool axis. 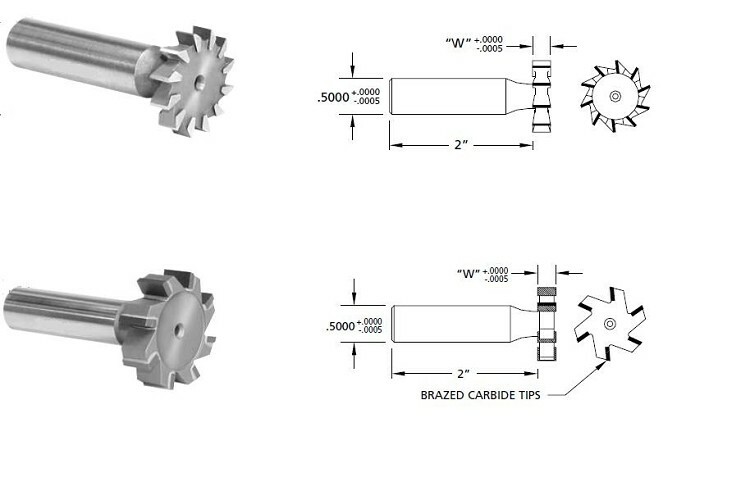 Differential Pitch Cutters - A specifically designed variation in the radial spacing of the cutter teeth. This provides a variation in tooth spacing and can be beneficial in reducing chatter. This concept is based on reducing the harmonic effect of the tool contacting the part in an exact moment of vibration. Dish Angle - The angle formed by the end cutting edge and a plane perpendicular to the cutter axis. Dish ensures that a flat surface is produced by the cutter. Entrance Angle - The angle formed by a line through the center of the cutter at 90 to the direction of feed and a radial line through the initial point of contact. As this angle approaches 90 degrees the shock loading is increased. Entrance Angle: Ramp in - The angle or radius value to enter the cutter into the part surface. Fillet - The radius at the bottom of the flute, from which core diameter is found. 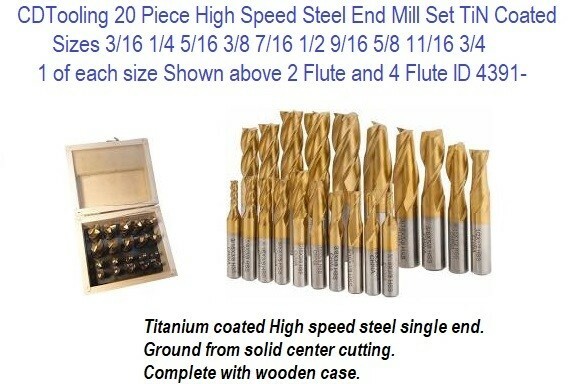 Flute - Space between cutting teeth providing chip space and regrinding capabilities. The number of cutting edges. Sometimes referred to as "teeth" or "gullet". The number on an end mill will determine the feed rate. Flute Length - Length of flutes or grooves. Often used incorrectly to denote cutting length. Gash (Notch) - The secondary cuts on a tool to provide chip space at corners and ends. The space forming the end cutting edge, which is used when feeding axially. Gash angle - The relief angle of the gash feature. Gash width - The width of the gash feature. The space between cutting edges, which provides chip space and resharpening capabilities. Sometimes called the flute. Heel - The back edge of the relieved land. It is the surface of the tooth trailing the cutting edge. Helical - A cutting edge or flute which progresses uniformly around a cylindrical surface in an axial direction. The normal helical direction is a right direction spiral. Helix Angle - The angle formed by a line tangent to the helix and a plane through the axis of the cutter or the cutting edge angle which a helical cutting edge makes with a plane containing the axis of a cylindrical cutter. Hook - A term used to refer to a concave condition of a tooth face. This term implies a curved surface rather than a straight surface. Hook must be measured at the cutting edge, making measurement difficult. (A) Cylindrical - a narrow portion of the peripheral land, adjacent to the cutting edge, having no radial relief. (B) Relieved - A portion of the land adjacent to the cutting edge, which provides relief. Lead - The axial advance of a helical cutting edge in one revolution. Length of Cut (Flute Length) - The effective axial length of the peripheral cutting edge which has been relieved to cut. Radial Rake angle - The angle made by the rake face and a radius measured in a plane normal to the axis. Rake - The angular relationship between the tooth face or a tangent to the tooth face at a given point and a reference plane or line. An angular feature ground onto the surface of an end mill. Axial rake - The angle formed by a plane passing through the axis and a line coinciding with or tangent to the tooth face. Effective rake - The rake angle influencing chip formation most. The effective rake angle is greatly affected by the radial and axial rakes only when corner angles are involved. Helical rake - For most purposes the terms helical and axial rake can be used interchangeably. It is the inclination of the tooth face with reference to a plane through the cutter axis. Negative Rake - Exists when the initial contact between tool and workpiece occurs at a point or line on the tooth other than the cutting edge. The rake surface leads the cutting edge. Positive Rake - Exists when the initial contact between the cutter and the workpiece occurs at the cutting edge. The cutting edge leads the rake surface. Relief-Space - Provided by removing material immediately behind the cutting edge. Done to eliminate the possibility of heeling or rubbing. Axial angle relief - The angle made by a line tangent to the relieved surface at the end cutting edge and a plane normal to the axis. Axial relief - The relief measured in the axial direction between a plane perpendicular to the axis at the cutting edge and the relieved surface. Helps to prevent rubbing as the corner wears. Concave relief - The relieved surface behind the cutting edge having a concave form. Produced by a grinding wheel set at 90 degrees to the cutter axis. Eccentric relief - The relieved surface behind the cutting edge having a convex form. Produced by a type I wheel presented at an angle to the cutter axis. End relief - Relief on the end of an end mill. Needed only for plunging cutters and to relieve rubbing as the result of corner wear. Flat relief - The relieved surface behind the cutting edge having a flat surface produced by the face of a cup wheel. Radial relief - Relief in a radial direction measured in the plane of rotation. It can be measured by the amount of indicator drop at a given radius in a given amount of angular rotation. Tangential rake angle - The angle made by a line tangent to a hooked tooth at the cutting edge and a radius passing through the same point in a plane normal to the axis. Tooth - The cutting edge of the Endmill. Tooth Face - Also known as the Rake Face. The portion of the tooth upon which the tooth meets the part. Shank - The projecting portion of a cutter which locates and drives the cutter from the machine spindle or adapter. Straight Shank - A cylindrical shank, with or without driving flats or notches, often seen on Carbide end mills. Weldon Shank - Industry name for a specific type of shank with a drive and location flat. The flat on the cutter provides positive ( non-slip ) driving surface to the Endmill.